The carpet is just exactly as pictured. However, the smell associated with carpet is extremely strong. But the rug arrived sooner than expected. The eclectic Lovato collection showcases a bohemian block print pattern in a neutral mix of silver grey, medium grey, and cream. Gorgeous and soft, this rug features a comfortable medium pile with minimal shedding. Great for high-traffic areas. Machine woven in Turkey with 100% polypropylene. Spot or professionally clean only. Rug pad recommended. Rug Size: 4'3" x 5'11"
Dimensions 123.0 In. X 94.0 In. X 0.32 In. 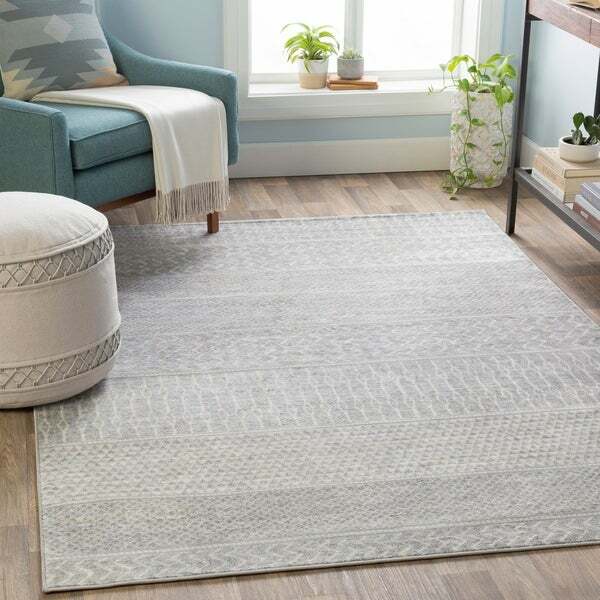 Option: Silver Grey - 7'10" x 10'3"
I am not sure if the previous reviewer stating that the color of this rug is nothing like was was pictured received the wrong product or not, but I received the Silver/Grey and it is spot on what the image depicted and could not be happier. The rug is on the thinnish side, so a pad should be used to give it a bit more cushion. 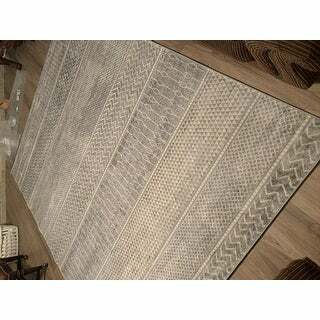 The feel of this rug under your feet is very nice and soft. It took about 24 hours for the rug to acclimate to my home, and lay completely flat. Option: Silver Grey - 5'3" x 7'3"
The color looked nothing like it looked online and was described and when I wanted to exchange I was very disappointed that the return shipping was not free and was quite expensive. I am keeping a rug that I am not happy with because I will not pay almost a third of the cost of the rug to return, Very sad. Option: Medium Grey - 7'10" x 10'3"
The rug arrived very quickly and packaged nicely. It rolled out flat on the first day. The colors are accurate as pictured. Nice rug at a great price. Very happy with this purchase. 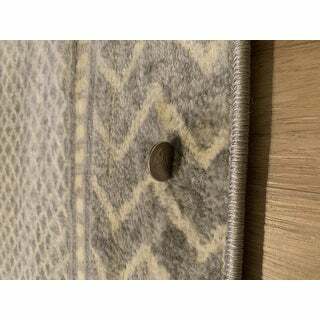 Option: Silver Grey - 8'10" x 12'3"
Great rug! It’s a bit thin but nothing a rug pad can’t handle! The color was exactly as it is in the photos here and it was a great value for the price. I will say it was a bit smaller than I anticipated it to be. This was a really great rug, but it was much darker in person. I purchased the silver and it looked more like the medium grey. 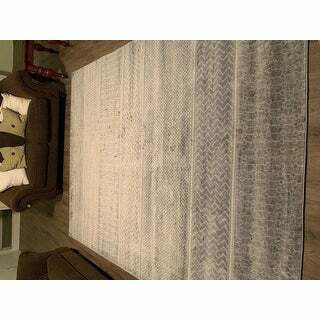 Option: Medium Grey - 8'10" x 12'3"
This is a beautiful rug! Super soft! I would've put 5 stars but color is a lot lighter than pictured. I ordered the medium and it's pretty light. I almost called to see if they sent me the wrong color! But it's a great value and I am super happy with it. I did put a pad underneath. Option: Silver Grey - 6'7" x 9'6"
The rug arrived very quickly and rolled out flat. I got the silver/grey and I will say it looks more like it's description. I feel like the picture makes it look more creamish then grey, but it's actually slightly darker then the picture, which I guess matches the verbal description. Still, it looks nice in my apartment. I gave this rug two stars because of the smell. It smells terrible, like horribly toxic chemicals. I've left my windows open while I'm at work today so hopefully that helps. But the smell really is overwhelming and is making me nauseaus. If it doesn't improve in the next few days I'll be forced to get rid of it. I ordered this rug because it was inexpensive and I liked the pattern. I do like the way it looks, however you get what you pay for apparently. I should have done more research on propylene rugs. The smell and off-gas has been so bad that I’ve had to open a lot of my windows and unfortunately it’s not warm outside. It’s given me quite the headache these last several days and it continues to do so. I would not buy this rug again and I’ll be more careful in the future when looking at material. Inhaling these fumes Is probably not healthy. Option: Silver Grey - 4'3" x 5'11"
The rug was perfect for my closet. It is soft to bare feet and the color looked great on the darker hardwood floor. Option: Medium Grey - 6'7" x 9'6"
Very nice quality and beautiful in our living room. The colors are nice and compliment any paint and furniture color. Very fast service and delivery. The print is beautiful and exactly what I wanted. It is so so very soft but it is a little thinner than I was hoping. "Is the pattern very noticeable. I want it to go with teal couch but then have chair with grey and ivory distinct pattern." The pattern is a bit faded but noticeable nonetheless.